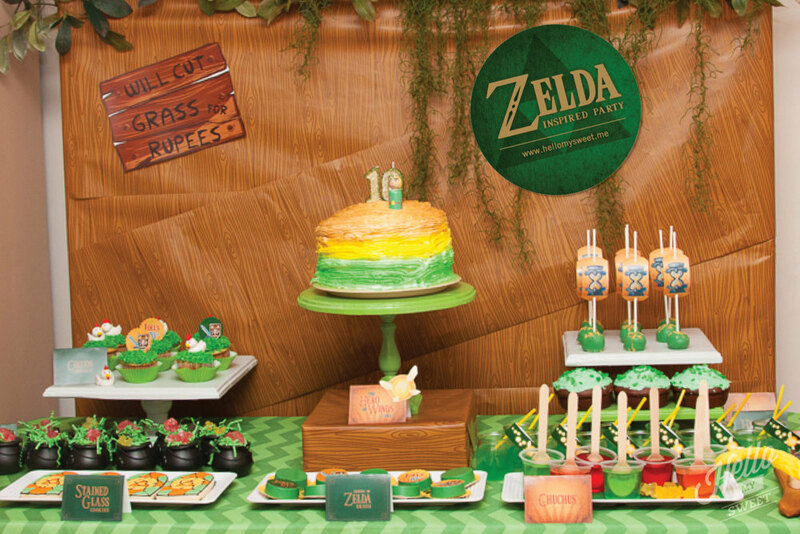 Now available in our shop, this awesome Legend of Zelda inspired birthday party printable collection! Our appreciation for our favorite past time and the game brought us to bring different things into the party from several of the Zelda games. The names of the food, the props, the background, and even the colors on the cake! We were so excited that Hello My Sweet created the perfect collection to go with our party and that so many elements of the games were presented into the design. The maps, swords, hourglass, and the poster like look of the design is also so representative of the most modern versions of Zelda games available today. We were truly happy with everything starting with the invitation to the cork on the water bottles! I created Zelda games bombs with honeycomb balls and used cardboard and crepe paper to do the tops. The background represents the woods with greenery and wood planks. The cutest sign as those found through the game. For the food we had Hero’s Cake, cakepops, chocolate covered oreos, cookies that represented Stained glass art found in the dungeons on the game, gelatin ‘chuchus’ which are a sort of jelly monsters, cookie hearts for lives, watermelon juice for potion drink to fill up on energy, forest water, a trail mix cupcake for fire arrows, cuccos chickens cupcakes which are chickens found through the games, and rock candy to serve as rupees…the jewels that Link finds through the game. Zelda Wallet bags were given as favors with jewel crayons inside for the kids to take home and enjoy. We had a wonderful time, plenty of fun and an incredible adventure enjoying all the goodies! Stained Glass Art Cookies - Sugarlily Cookie Co.